I don’t get excited about politics. In fact, I don’t have a political bone in my body. However, I am attracted to the presidential election for two reasons: strategy and competition. Much to the chagrin of Sidney, I have watched the Democratic and Republican debates with great interest. I enjoy watching the candidates compete with each other. Because I have watched these debates, I have learned a lot about the candidates from both sides. Living in South Carolina is pretty cool right now. Our state is on a national stage as candidates campaign for the primaries that will be held on Saturday (Republican) and later this month (Democrat). These presidential contenders are taking over South Carolina as they hold rallies and town halls in every nook and cranny of the state. Tonight I went to my first ever political rally. I saw Marco Rubio in North Myrtle Beach. Wanting to capitalize on this madness, I attended my first ever political rally tonight. As I mentioned, I have watched all the debates and this has led me to get a good gauge of each candidate. Because I feel like I kind of know each presidential hopeful, both Democrat and Republican, I thought it would be kind of cool to see one in person. Marco Rubio rolled into town this evening and Sidney and I decided to go see him. We didn’t do this for political reasons, we did this for the experience. We arrived to a packed conference center in North Myrtle Beach about 15 minutes before the rally was about to start. As all the chairs were already taken, we stood about 80 feet from the stage. As we waited, patriotic music played and diehard Rubio supporters started chants. Finally, it was show time. Tonight’s rally reminded me a lot of a concert or comedy shows; you have opening acts. 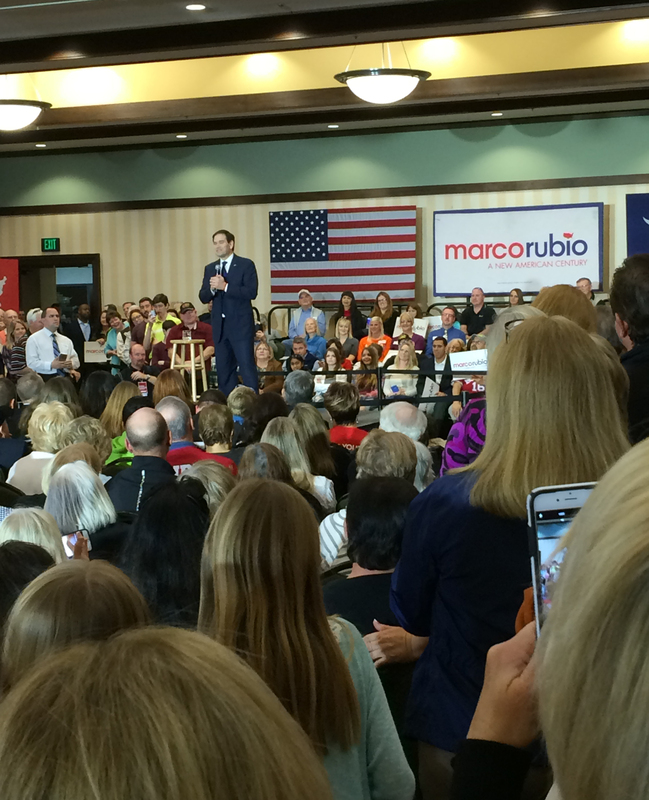 Before Rubio talked we heard from a random elderly woman, the mayor of Myrtle Beach, and a congressman. Then, before Rubio took the stage, there was one more speaker. U.S. 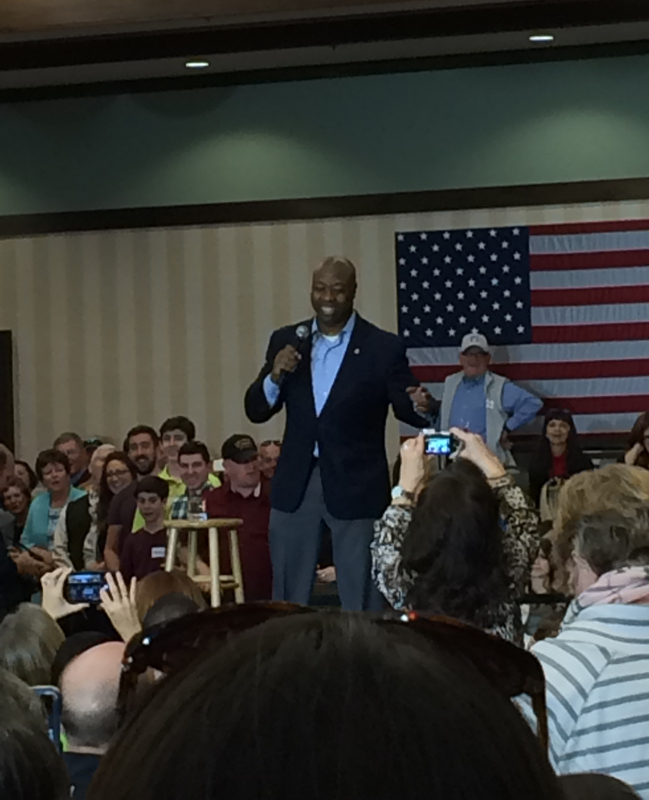 Senator Tim Scott introduced his Florida colleague. Scott, the South Carolina senator not named Lindsey Graham, was a phenomenal speaker. It was actually a lot of fun to listen to him talk and he gave Marco Rubio an awesome introduction. A photo I took of Senator Tim Scott tonight. The guy could really talk! 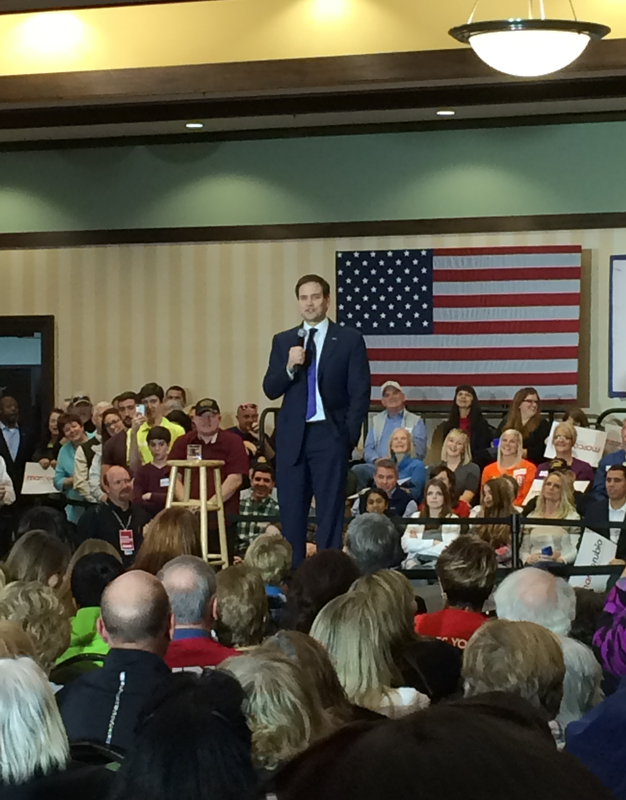 As you might expect, Rubio came out and claimed the stage with energy. As the crowd chanted “Marco! Marco! Marco!” he waited for it to die down just a bit and then he spoke into the microphone for the first time. “Please don’t say Polo,” he quipped. That line pretty much summed up his 40 minute address. Throughout his whole talk he constantly made jokes…and most of them were funny. Even when he alluded to Trump he did it with humor. The only time his tone noticeably changed was when he talked about Hillary Clinton. When he criticized her the words seemed to shoot out of his mouth like venom and it was the exact same serious Rubio most of you have watched during the debates. This is where we stood during the rally (no zoom). But besides a couple of those moments, he gave an engaging, humorous address. He also did it seamlessly. His speech was clear and well-delivered but it also seemed a little packaged too. He knows what he believes and he has no problem at all getting those beliefs across. He just stood up on that stage and did his thing. Each time I said to myself, “Now when is he going to start talking about (insert a political issue)…” he literally segued right into talking about it! It was weird. Marco Rubio in the middle of his speech. Even though I had never attended a political rally before, the audience was exactly how I thought it would be. They clapped loudly, they yelled out answers to Rubio’s hypothetical questions, they audibly said “YES” whenever he talked about his platform, and they booed when he brought up a rival. 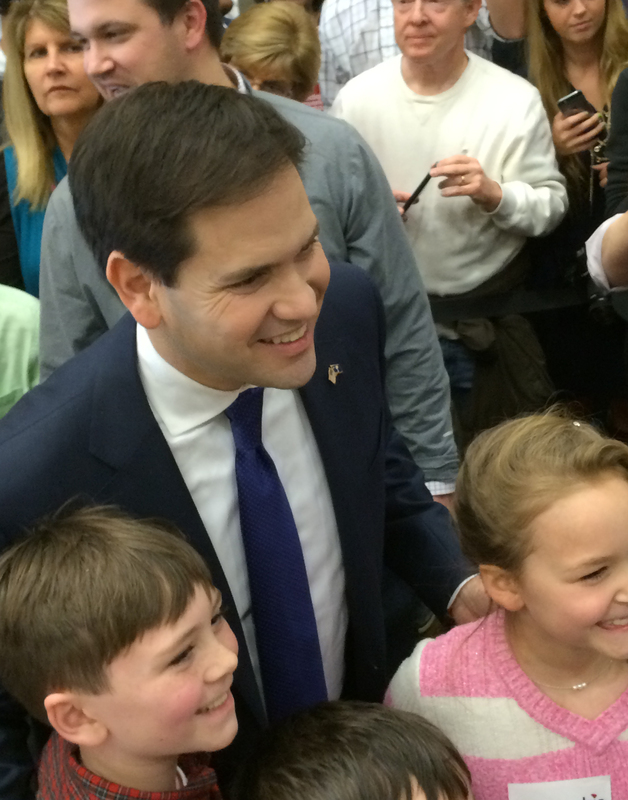 I was standing on some bleacher steps when I snapped this photo of Marco Rubio. The speech was well done but he drew out the ending. After he said “in conclusion” he went on for about ten minutes. But he made up for it afterwards as I watched him interact with all the excited people who wanted to meet him. Although I wasn’t necessarily “excited”, I thought since I was at my first political rally I would meet my first presidential candidate. 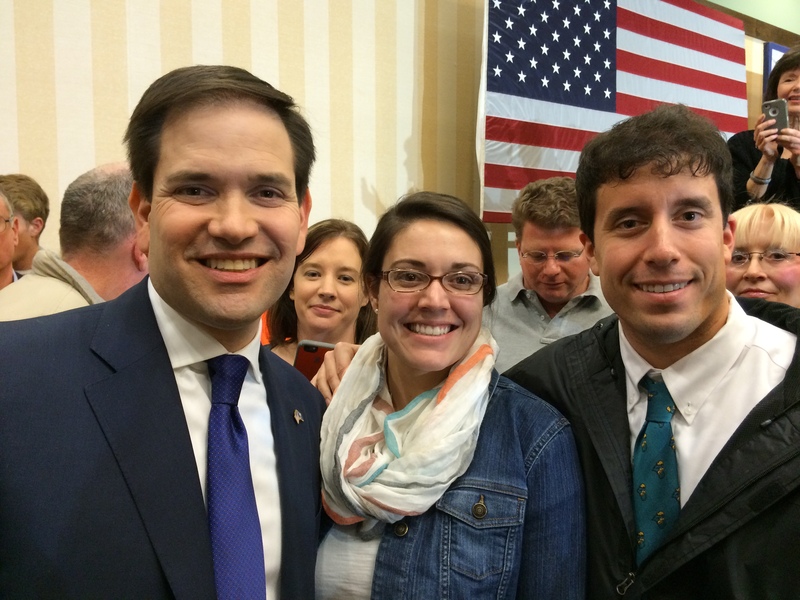 After Rubio had already stayed out in the conference room for at least 20 minutes after his speech, he took the time to shake my hand and take a photo with Sidney and I. Although the political life isn’t for Sidney or I, we enjoyed tonight’s experience. Living in South Carolina we have the opportunity to watch firsthand the race to the most powerful office in the world. Informed or ignorant about politics and policies, this is something that all of us who are able to should take advantage of. Don’t Blink.